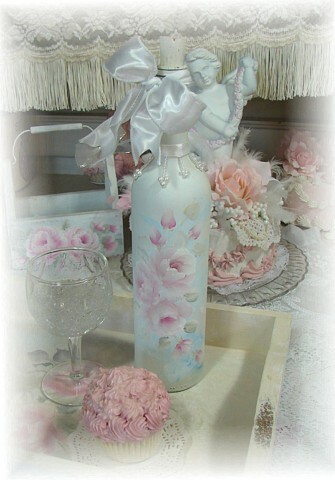 Romantic cottage bottle to add a little charm to your home decorating. I hand painted beautiful roses, buds, with a white ribbon and rose also little dangle beads to tie it off. 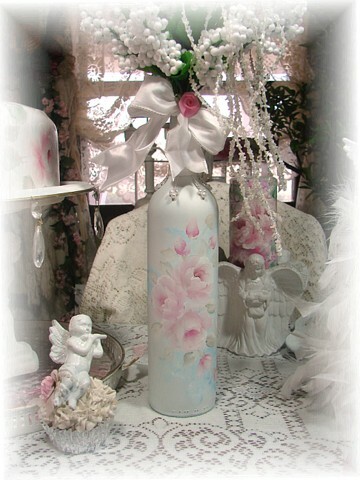 You could add florals, a candle or standing on its own to add a little romantic charm to your home. This is hand painted one of a kind. Signed, Sheila Cottrell and dated. Water can be put in the bottle but never place the bottle in water. To clean all artwork wipe with damp cloth.